Sonargraph offers the powerful feature to add custom metrics and issues via scripts and I demonstrated in a previous blog post how this can be used to detect “Singletons”. This post concentrates on the metric part of the API. The metric “Depth of Inheritance” is defined as the depth of the inheritance tree as defined by Chidamber and Kemerer, i.e. the maximum length of the current type to the root of the inheritance tree. The core idea of the API is to process the Sonargraph parser model, which forms a tree structure, with the visitor pattern, i.e. the script provides hooks to visit the parts of the model that are needed for the specific task. For the calculation of the metric “Depth of Inheritance” we need to provide functionality for the onType() method. As a first step, we open a Sonargraph system and create a new script. The generated script template already contains the correct visitor and implementation for the onType-closure. The script does not need any programming language-specific information, so it is best to stick to ‘coreAccess’. The script is already executable and simply puts all types in the result set. The following screenshot (click to enlarge!) 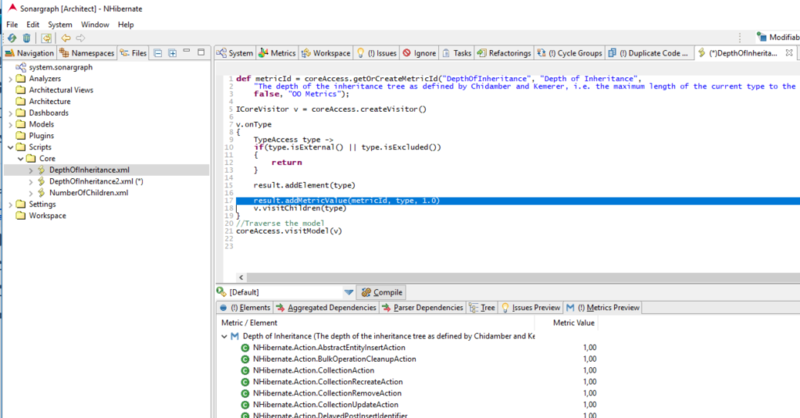 shows the Script view and the generated result containing all types of the NHibernate project. 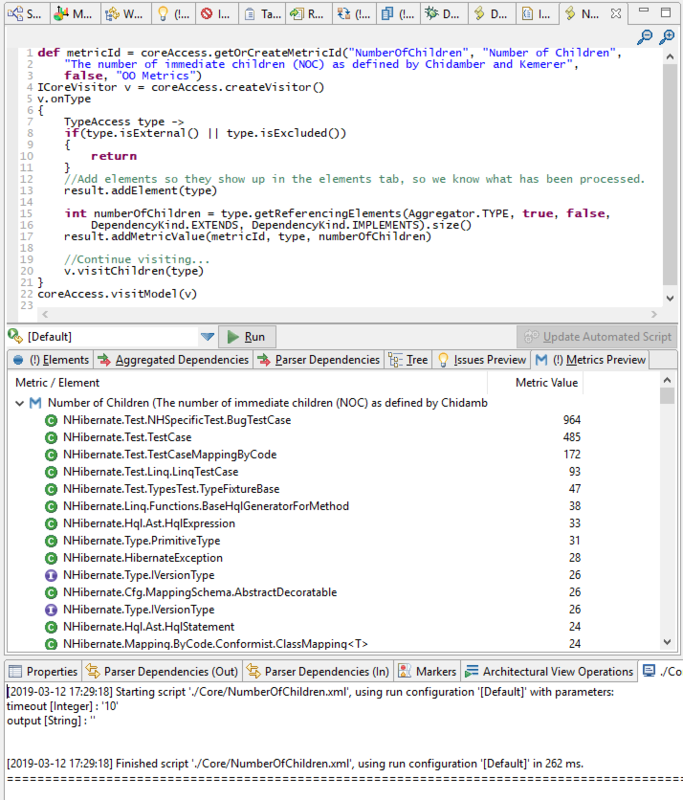 As we want to create a new metric, we need to call the method coreAccess.getOrCreateMetricId(). The metric value is added by calling result.addMetricValue() as shown in the highlighted line in the screenshot. Here we simply add a constant value “1.0” for testing purposes. 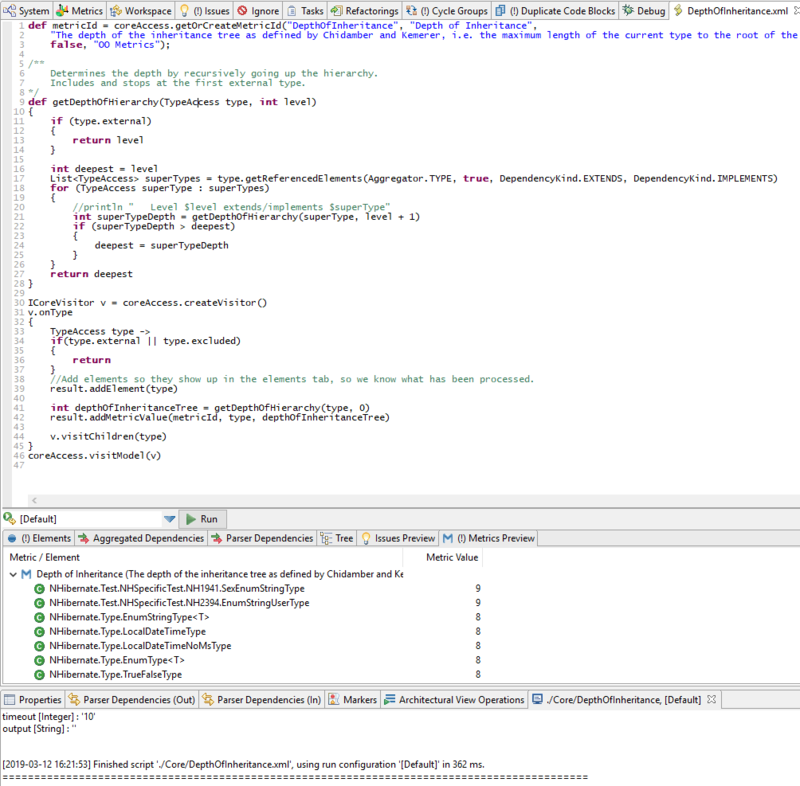 The first parameter “aggregator” specifies the level to which the outgoing dependencies are aggregated. 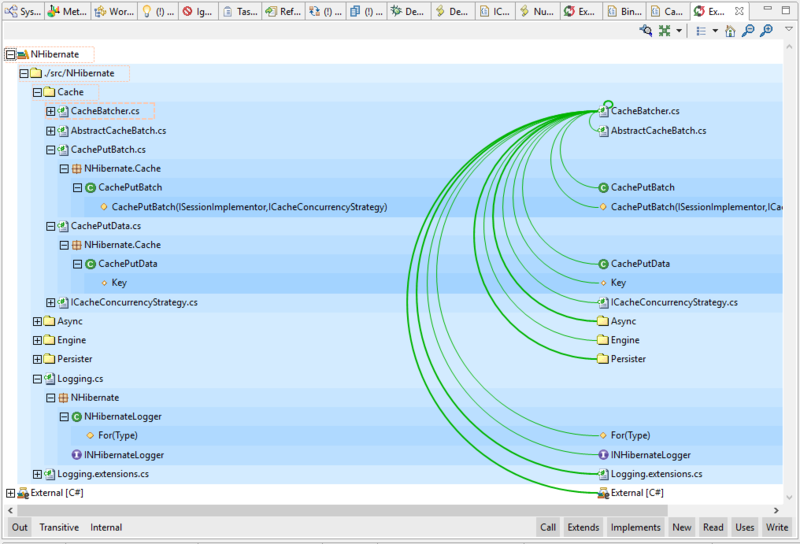 The screenshot below shows the outgoing dependencies of “CacheBatcher.cs” in Sonargraph’s Exploration view. Endpoints are the constructor of CachePutBatch, the field CachePutData.Key and the interface INHibernateLogger to name a few. The “aggregator” provides the common level to which the endpoints of the dependencies are rolled-up. The varargs “types” specifies the dependency types. For the inheritance information, we are only interested in “extends” and “implements”. The next screenshot shows how the function is used to gather the inheritance dependencies. It also demonstrates how throwing a RuntimeException can short-circuit the script execution. This is useful, if you develop the script for a large system and don’t want to get overwhelmed by the debugging information printed to the Console view with the “println” statements. The exception stacktrace within the script is indicated by the error markers. 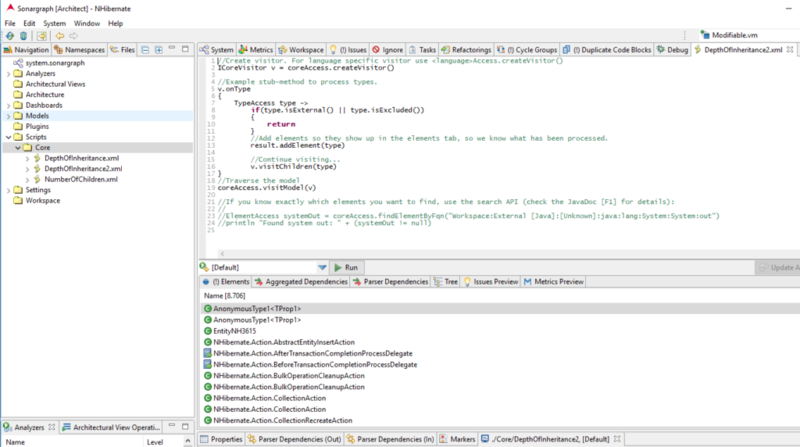 The Exploration view shows that there are two EntityAction types in different source files. Opening those via double-click reveals that they both are partial classes, so the information retrieved from the script is correct in the sense that Sonargraph treats partial classes individually if viewed from the “physical” perspective. The Namespace view allows examining the system from the “logical” perspective, and opening the Exploration view from the Namespace view will show the unified type EntityAction. The method getDepthOfHierarchy() must obviously be called recursively to gather the complete inheritance information. Since we are mainly interested in the depth of inheritance of the code within the Software system, we stop at the first external type, i.e. a type that is referenced by our code, but that is not part of the workspace. Thus, the calculation includes the first external type in the hierarchy, but stops there. 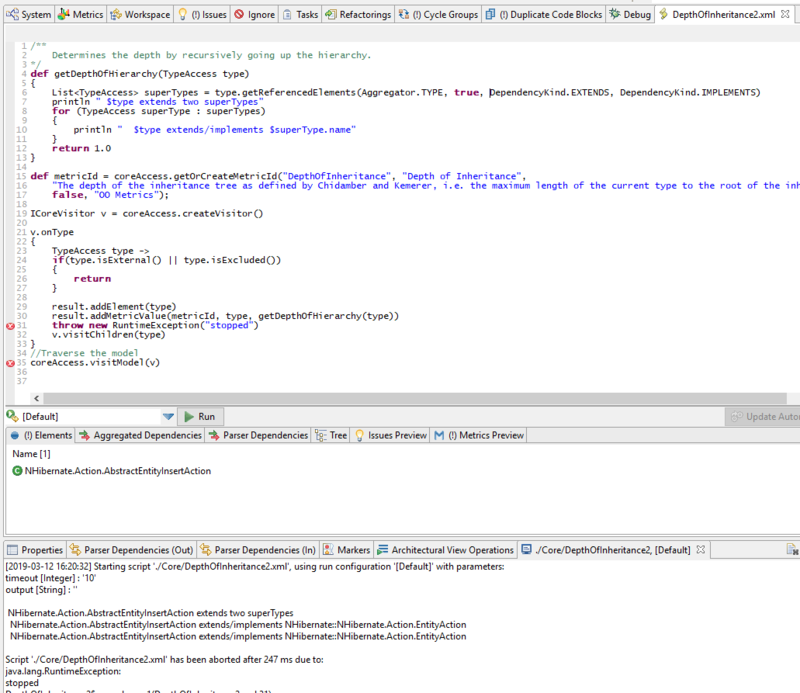 The screenshot below shows the final script that is only 46 lines long with generous formatting. The final script uses the Groovy shorthand notation for method invocations like type.external instead of type.isExternal(). For the NHibernate project with ~570k lines of code, the script finishes within 264 ms on a Intel(R) Core(TM) i9-8950HK CPU @ 2,90GHz. The top-scorers with a “Depth Of Inheritance” of 9 are the types NHibernate.Test::NHibernate.Test.NHSpecificTest.NH1941.SexEnumStringType and NHibernate.Test::NHibernate.Test.NHSpecificTest.NH2394.EnumStringUserType. The inheritance tree can be examined in detail by opening the Graph view from the context menu, by selecting the “Advanced” menu entry and specifying “Out”, “Transitively” and dependency types “Extends” and “Implements”. 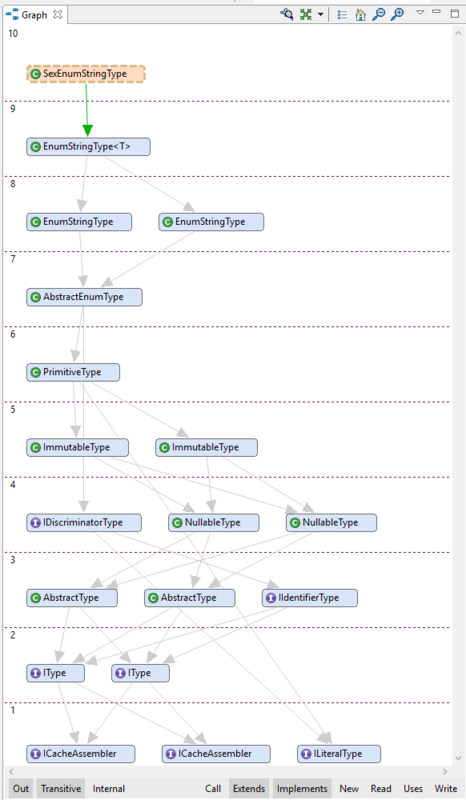 The Graph view shows the information about the “levels” which represents the depth of inheritance in this case: We have 10 levels, because the type SexEnumStringType itself is also represented in a separate level which is different from the script, where it is not included. Both scripts are contained in the “core” quality model of the Sonargraph 9.10 release. This blog post demonstrated how the Script API of Sonargraph can be used to implement new metrics with very little code. The editor within Sonargraph allows the interactive implementation and provides quick feedback about the results. An in-depth analysis of the inheritance tree can be done for the top-scorers individually via the graphical representations in Sonargraph.